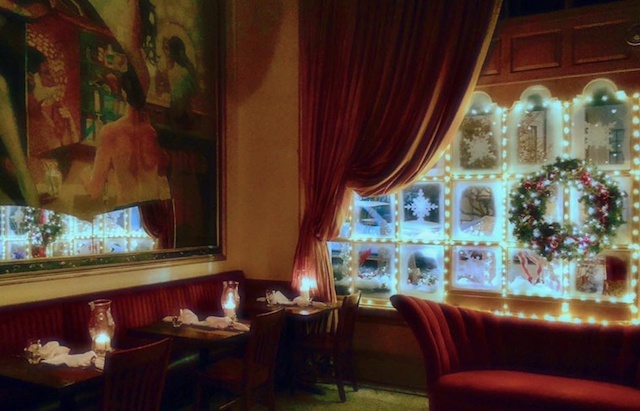 Last year I had the joy of attending Sotto Sopra Restaurant’s evening of holiday songs. They created an ensemble of their Broadway Night singers for an evening of the holiday season’s most beloved songs The live performances in this stunning venue really set the tone for 2017’s holiday season. Lucky you, they are doing an Evening of Holiday Songs and a Four Course Dinner, Sunday, December 2, 2018 starting at 6 pm. They might not have “chestnuts roasting on an open fire” though they assure you a wonderful holiday evening. Sharen Camille, one of their favorite Broadway singers and coordinator of this holiday event, joins them again this year bringing her fellow performers who have graced numerous stages including Broadway, Carnegie Hall and Lincoln Center. Sharen Camille – Soprano: In New York, Sharen joined the historical ranks of NY’s longest running musical, The Fantasticksas The Girl. “Sharen Camille, with her striking features and strong voice is a natural” said the Washington Square News. Sharen’s musical theatre career has included tours portraying: Ellie in Showboat,Louisa in The Sound of Music, and Lucy in A Christmas Carol; as well as numerous musical theatre productions with performances that include: Marian in The Music Man, The Mistress in Evita, Cinderella in Cinderellawith Zsa Zsa Gabor, Louise in Carousel, Agnes in George M, and Godspell. Emily Frye – Mezzo-Soprano: A highly regarded soloist and choral singer in the Baltimore/DC metro area. She received her Bachelor’s in Vocal Performance from UMBC and studied overseas at The University of East Anglia in Norwich, UK. Her recent performances have included a variety of styles such as opera, art song, large choral works and oratorios. Emily’s vocal talents have been showcased as a soloist in works including: The Bach B Minor Mass, Bach’s Magnificat, the Mozart Requiem, Haydn’s Harmoniemesse, The Rossini Petite Messe Solonelle and the Schubert Mass in A Flat Major. She has appeared in distinguished Baltimore favorites including Light City and the Washington Monument lighting. Cameron M. Ashbaugh – He has worked as an actor and singer in Pittsburgh, Washington D.C., Annapolis, and Baltimore. A performer for most of his life, Cameron’s vocal talents have included solo work, choral pieces, and recordings in such venues as the National Broadway Chorus, Keystone Repertory Theater, and Compass Rose Theater. Graduating in 2012 from Indiana University of Pennsylvania with a BFA in Vocal Performance his recent appearances have included Anne Frank and Brigadoon. When not on stage Cameron can be found in front of his rapt audience of 6th graders as a Language Arts Teacher in Waldorf, MD. Patricia Mckewen Amato – Pianist: She served as assistant music director of the Baltimore Opera Company and music director of its touring company; music director/conductor for Annapolis Opera, Maryland Lyric Opera, Brevard Music Festival, Opera Americana, Washington Savoyards, Peabody Institute of Johns Hopkins University, and Rep Stage; and assistant conductor/chorus master for Washington Summer Opera and Opera AACC. A versatile pianist, Ms. Amato frequently performs with the Children’s Chorus of Maryland, Annapolis Opera, Annapolis Chorale, Baltimore Choral Arts, Baltimore Symphony, Maryland Symphony, Baltimore Opera, Prince George’s Opera and Philharmonic, Chesapeake Chamber Opera and Metropolitan Opera regional competitions. She is a first place winner in the Houston Chamber Music Society Competition. She made her Lincoln Center conducting debut in 1999 and is recorded on Koch International. It is true what they say, this is “the most wonderful time of the year” and they invite you to an evening of stellar renditions of your holiday favorite songs interwoven with our fine Italian cuisine.